So in this article, following upon our previous two DI box guides, we endeavor to go deeper into the topic of what a DI or direct box is. By the end of this article, you know have a clearer understand of how they work. 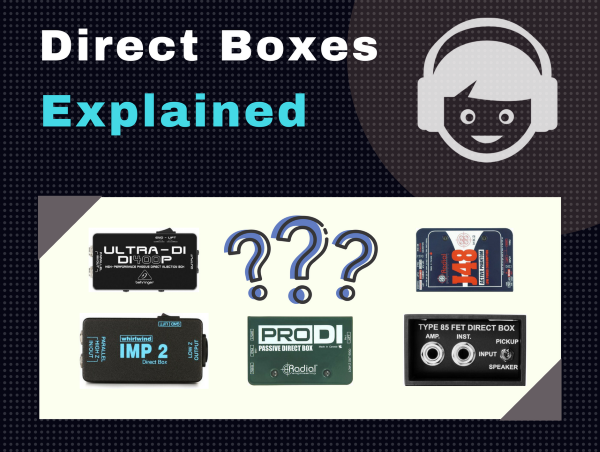 DI Boxes Explained –what is a Direct Box? At it’s very basic, DI boxes are electronic devices that match impedances between different pieces of audio equipment. Originally intended as a solution for the impedance mismatch between guitar pickups and mixing consoles, DI boxes have since been designed to include additional features and to perform even more functions. Many modern DIs are in fact capable of doing so much more than their early counterparts, which is why, no doubt, some people get confused in the differences between a DI and preamp. Nevertheless, all direct boxes perform the basic function of converting high-impedance, unbalanced signals to low-impedance, balanced signals. 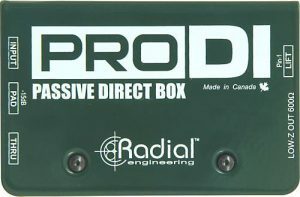 A passive DI by Radial. One of the top passive DIs recommended for any instrument, including electric and acoustic guitars. Passive DIs are relatively simple devices that utilize transformers to convert high-impedance to low-impedance signals. The transformers in these devices have separate windings for the input and output stages, essentially isolating ground-level voltages and eliminating ground loops. This has the effect of matching impedances between the input and output signals, as well as eliminating the ground hum that is typically present at the input stage. Passive DIs are commonly used for devices that have sufficiently high outputs (such as an electric guitar or keyboard). Their durability and low cost makes them popular options for live applications and home studios. Active DIs have preamplifiers that boost the signal before sending it to the output. Hence, this is the DI that many people sometimes confuse with your standard preamp. Originally developed as a solution for increasing the gain of low output devices such as single coil guitar pickups, they are also used to compensate for the volume loss inherent in long cable runs. In addition, many active DI boxes have more complex signal routing options and higher headroom, making them suitable for line-level devices as well as active guitar pickups. The additional circuitry in an active DI box requires the use of a power source. 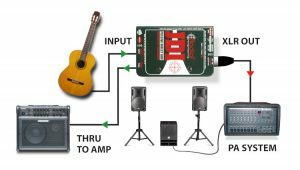 Depending on the model, active DI boxes may run on battery power, a dedicated power supply, or 48V phantom power supplied by a mixing board or preamp. Most DIs are single channel mono devices. However, there are also stereo DIs available on the market, most of which are simply two mono DIs housed in a single unit. In most cases, you could get the same sound quality and functionality from two mono DIs as you would from a stereo DI. That being said, the latter does provide the benefit of simpler cable management. Like we mentioned, most DI boxes are fairly simple devices, with an unbalanced 1/4” input on one end and a balanced XLR output on the other. Inside the housing is a transformer that converts incoming high impedance signals to low-impedance signals. 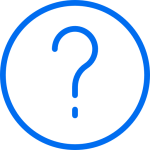 The signal is then sent to a mixing console’s channel strip (which usually has its own preamps) or a dedicated preamp or signal processing device. DI boxes usually send the processed signal out of balanced XLR outputs. This enables the use of longer cables without any signal loss or degradation. Some DI boxes also include other features that compensate for varying input levels or provided additional signal conditioning among other capabilities. Apart from the transformer, a ¼” input, and an XLR output, some DI boxes come with additional useful components and features. Ground lifts help eliminate the buzz and hum that may be caused by ground loops. These switches essentially disconnect the XLR jack’s Pin 1 from the circuitry, preventing the flow of current from the DI to the receiving device. This has the effect of breaking the ground loop, thereby reducing noise. Pad switches attenuate incoming signals by a certain amount of decibels. These switches are typically switchable between -15dB and -20dB settings, although some devices may allow attenuation of as much as -40dB. Pad switches are useful for attenuating the signal from active guitar pickups and high output line-level devices. A potentially useful feature in many DI boxes is a thru/bypass output, which essentially splits the signal into two outputs. In most designs, the thru output carries the signal as processed by the DI circuitry, while the bypass output simply sends out the unprocessed signal. This makes it possible to send a single instrument’s signal to a mixer and a guitar amp at the same time, with both receiving the optimum volume level. Other features that may be included with DI boxes are additional channels and polarity switches. These enable you to process several devices at once and to correct phase issues, respectively. If you want to plug your guitar directly into a mixing console for recording (like a USB mixer), a DI box is absolutely essential. Plugging a guitar directly into a console will usually result in a dull and lifeless sound, with the treble becoming increasingly harsh as you push the signal. By using a DI box, you can record your electric guitar at a sufficiently loud and clear volume. DI boxes are also useful live, even with instruments that you would normally plug directly into the PA system. Most keyboards and synthesizers have only unbalanced line outputs, making them prone to noise and electrical interference. By patching in a DI box between the keyboard and the PA system, you can reduce noise as well as eliminate buzzing and humming, while ensuring optimum volume levels. 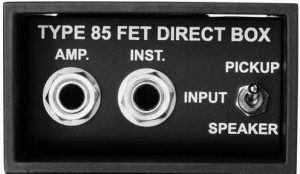 Even if you are accustomed to plugging in your electro-acoustic guitar into a dedicated onstage amplifier, it would be helpful to have a DI box handy. With a DI box, you can split the signal out to the amplifier for onstage monitoring, while the balanced signal is sent to the PA. And in the event of an amplifier failure, you could simply continue playing through the PA and go on with the show. Finally, DI boxes enable you to compensate for long cable runs. More than just a physical inconvenience, lengthy cable runs could result in signal loss and excessive noise. DI boxes ensure a clearer and louder signal while reducing the clutter from having a mess of cables onstage. On a side note, if you’re looking for information on cables for speakers and studio monitors, check out this article. One of the most common applications for DI boxes is routing electric guitar or bass guitar directly into a mixing console. Plugging such instruments directly into a mixing board generally results in a weak and dull sound, excessive noise, or harsh treble response. By patching a DI box in between the instrument and the mixing board, you can get a cleaner and clearer signal, with sufficient level and headroom. Most electronic keyboards and synthesizers can be plugged directly into a mixing console without any loss in quality or volume. However, there are instances wherein using a DI box might be the better option. Low level instruments will of course benefit from the level matching that a DI box provides, while higher level instruments can be more easily tamed with the pad switch included in many DI boxes. DI boxes can be essential tools in most every recording or performance-related scenario. Even if you’ve never used one before, the benefits that a good DI box provides in terms of flexibility and ensuring optimal sound quality might just be good enough reasons to invest in one. For more information on the ones we recommend, take a look at the DI boxes we’ve covered for electric guitar and acoustic guitar. Sweetwater: The DI Box – What is it? Why Do I Need One?